In Turkey, pita (called pide) has a soft, chewy texture and is pocketless. The pizza-like foods called lahmacun are made with oval-shaped pieces of pide dough topped with finely chopped meat and herbs before baking. Pide also refers to another pizza-like food made of pide dough topped with different ingredients. Regional variations in the shape, baking technique, and topped materials create distinctive styles for each region. Such pides can include chicken, beef, cheese, potatoes, garlic and many other ingredients. In Greece, pita is eaten with dips, such as tzatziki, and is a major component of pita-souvlaki and pita-gyros. 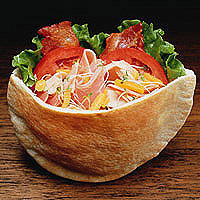 These types of sandwiches involve the wrapping of souvlaki or gyros with tzatziki, tomatoes, feta, cucumbers, and condiments into a pita bread. In the former Yugoslavia Pita is an extremely common dish. The word Pita, is a general term for Burek (Pastry with Beef), Sirnica (Pastry with cheese inside), Zeljanica (pastry with Spinach inside), and Krompiruša (Pastry with diced potatoes inside), but nonetheless there are many other types of Pita. It is a traditional dish, and is commonnly eaten for any meal of the day. In Bosnia, among the local Muslims, a specially prepared somun with egg yolk and seasonings is a traditional bread for dinners during the fast in the month of Ramadan. In some areas it is known as 'Pita sa (Pie with)....mesom (meat), sirom (Cheese) etc.